A molecular mishap during transport transforms Picard, Ensign Ro, Keiko and Guinan into twelve-year-old children. Before O'Brien can reverse the effects, the Ferengi attack and claim the Enterprise as salvage. "Rascals" marks the directorial debut of Adam Nimoy. In an attempt to get closer to his father, Alexander has Lt. Barclay program a Wld West adventure for the two of them. When an engineering experiment goes awry, all of the holodeck characters become datas, and Sheriff Worf must outdraw Data to save his son's life. 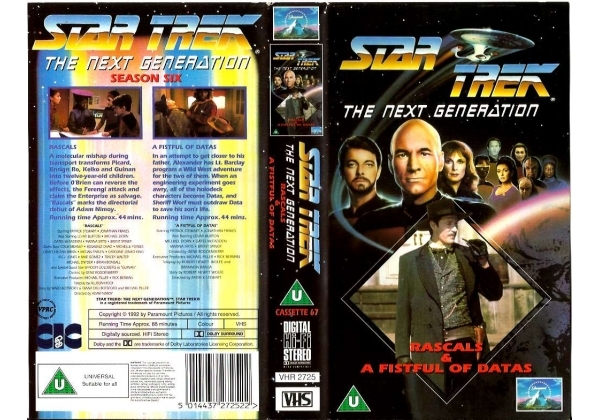 Or find "Star Trek: The Next Generation Cassette 67 - Rascals/A Fistful of" on VHS and DVD / BluRay at Amazon.